If you own a condominium, apartment, or another type of home that is on the smaller side, you likely understand how challenging it can be to find the right lighting solutions that provide adequate illumination without taking up a lot of space. Fixtures like chandeliers and ceiling fan/light combos are beautiful, but they might not be the best solution for small rooms. In today’s post, we’ll review four types of lighting design that works well in small spaces and provide some examples of why they are beneficial. 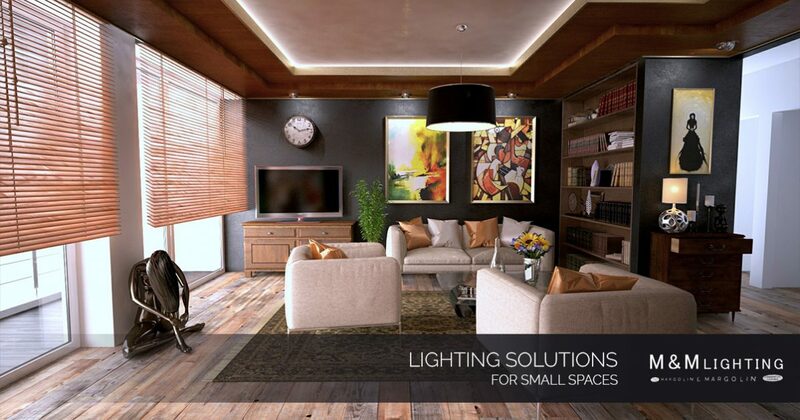 Are you looking for lighting solutions for your home? M&M Lighting in Houston is your one-stop shop for affordable fixtures, ceiling fans, and more. Browse our online catalog now or call us to schedule an appointment with one of our sales consultants! Because they have the potential of adding a large amount of illumination to a room while being minimally intrusive, track lights are a popular fixture choice in small living spaces like apartments and condominiums. Track lighting features multiple lights on a track that is hung from the ceiling, allowing for adjustment of each individual fixture to provide intentional and precise lighting. Interior designers and homeowners alike find that this type of fixture is incredibly helpful for small spaces where table, wall, and floor space is limited. Some people even choose to angle the lights so they shine at mirrors or other reflective surfaces to generate more light, making the room appear bigger. Sconce lighting has been around for centuries, originally featuring lit candles held by wall mounts. Modern-day sconces are not too far off in terms of design, and they come in a wide variety of styles that make them an affordable and versatile choice for illuminating small spaces. Because they are attached directly to the wall, they don’t take up valuable floor or table space. They often direct light upward, and that can make a room seem taller and larger than it really is. Have a small bathroom that needs more light? Single-light sconces are wonderful for adding additional light to small spaces. Looking for significant illumination from a sconce fixture? Choosing one that has multiple bulbs easily accomplishes the task. Some homeowners struggle with available floor space in their small living quarters while others may not have the wall or ceiling space required for sconces or track lighting. Whether it is because of the way their home is constructed or they have prized art collections that fill the walls in their home, many people choose to stick with traditional floor and table lamps to illuminate their small spaces. Incorporating this type of lighting into your home can be beneficial for many reasons. Lamps are usually fairly narrow, allowing them to be placed virtually anywhere. They are also portable, which means you will always have adequate lighting, even when you rearrange your furniture. If you have the ceiling space to add extra lighting fixtures but don’t really care for the appearance of track lighting, pendants make excellent lighting solutions for small spaces like condos and apartments. These hanging light fixtures come in a wide variety of styles and colors, so no matter what your existing decor is, you are sure to find one that suits your design preference and budget. If you are aiming for lighting design that has a modern, yet minimalist, feel to it, Edison bulb pendants are a popular choice for homeowners because of their classic simplicity. Mini pendants can also be purchased with interchangeable shades, allowing you to change the style of your fixture quickly and easily. If you are looking for a wide variety of sconces, lamps, pendants, and other innovative lighting solutions for small spaces, M&M Lighting in Houston has you covered. We carry thousands of in-stock fixtures for the convenience of our customers, and you’ll always find the best products from the world’s top manufacturers in our inventory. With more than 50 years of experience in the lighting industry, you can rely on the lighting advice provided by our experts. Ready to begin your lighting design project? Call 713-469-3002 to speak with a sales consultant today!